My last take on the Craft Barn calendar challenge demanded a bit of a nudge from somewhere. 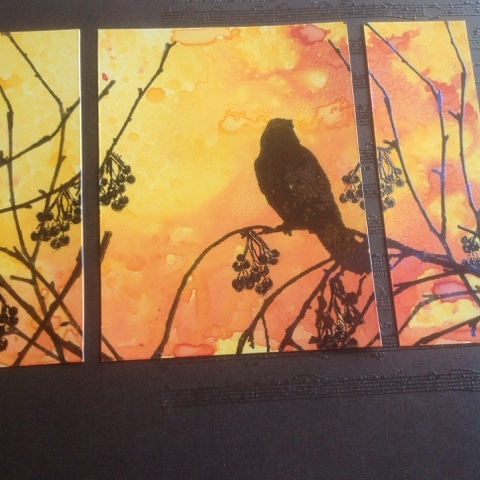 Luckily the Paperartsy challenge introduced triptychs, and I thought that would perhaps be the solution. Also posting for the WOW challenge (anything but a card). This is a scrappy layout calendar, and I have been at loss for layout ideas... but haven't gotten aroung to searching for sketches. I started by preparing my "photo": I sprayed Lindy's Orange and Dylusions yellow, after which I stamped the bird and branches, heat embossing with clear embossing powder. The Craft Barn challenge prompts are Orange and Pumpkin/Fruit... I had been planning to do some pears, because I have a pear stamp. The "photo" was looking great, and not at all like it had anything to do with pears (I found myself humming 'a partridge in a pear tree'), so I had to think of something else. 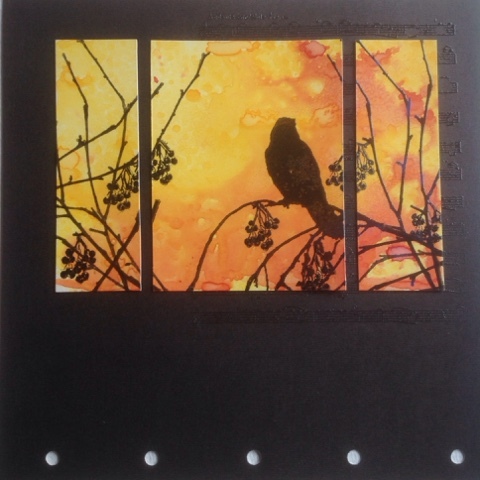 I ended up going through my stash, and found a winter bird stamp with rowan berries - I'm claiming them to be fruit. The berries look as if I miss-stamped them, but actually the double lines are probably supposed to be a layer of snow. I stamped them by colouring the berries with a Distress Marker (black soot) and had some trouble placing them where I wanted, but as I coloured them in to create the silhouette effect, I also drew some branches, where missing. In the above picture, the coloured bunch and the branch I drew for them look grey, because they have unheated embossing powder on them. I chose a dark background to mat the "photo" on, and heat embossed a large music stamp before adhering the triptyche. 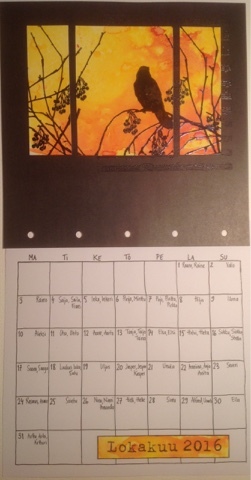 This calendar page has no grid yet, because that will be behind the November page. I have updated my September page with a photo of the grid that I drew behind this one. Gorgeous card! Congrats on your win at Wow EP! Beautiful! Congrats for your win at WOW. Oh I love this, especially the background! Thank you for joining in The Craft Barn Calendar Challenge. Wow, love it! A perfect page for October. 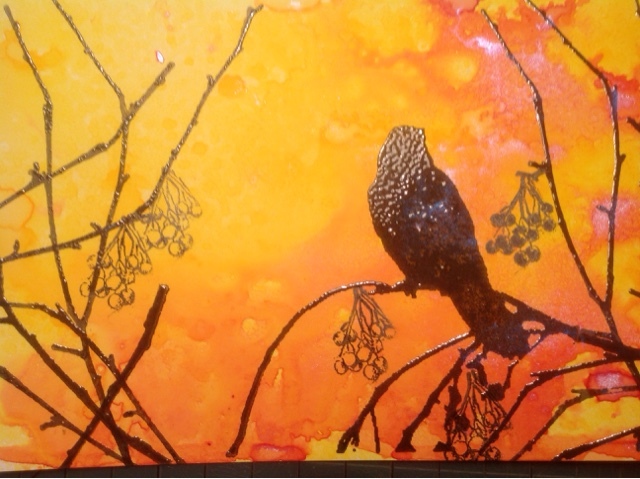 Gorgeous, love the rich colours with the silhouettes.